V0650. 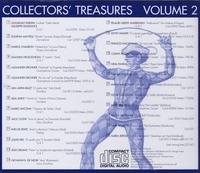 COLLECTORS’ TREASURES, Vol. II, incl. Maclennan (Tannhäuser), Russitano (Otello), Mantelli (Lucrezia Borgia), Chambon (La Juive), Kirchner (Le Prophète), Cucini (La Gioconda), de Frate (Nabucco), Greeff-Andriessen (Die Walküre), Walker (Der Evangelimann), Molin (Lakmé), Panina (Pique Dame), Yuzhina (Pique Dame), Markovich (Snegoroutchka), Katulskaya (Sadko), Koshetz (The Enchantress), Biel (Il Trovatore), Ancona, Kruszelnicka, Delmas, Jeritza, Adini, de Negri, Mei-Figner & Gryzunov. (UK) Collectors’ Treasures GECT 002, recorded 1902-30. Produced by Bill Breslin. Biographical notes by Alan Bilgora. Transfers by Norman White. Currently unavailable. "The initial volume in this series gave so much pleasure that it seemed unreasonable to hope that a second volume could equal, let alone surpass it. However, not only does it exceed expectations, but emerges as perhaps one of the most enjoyable collections yet encountered....Altogether, this is a further, highly worthwhile production from Emporium Records, which can be unhesitatingly recommended." "These are treasures for collectors in the plural, but they come from the treasury of one collector: Bill Breslin….Such collector’s may seem marginal in musical life, but these enthusiasts are the preservers of live musical history: records here document the performing practices of a time long distant, of the late 19th century as it passed into the 20th. All 26 items here are of the utmost rarity as far as original copies are concerned, and often rare as samples of the art of the particular singer….Those who might be thinking of venturing a tentative toe into unknown waters will be astonished by the clarity and immediacy of these voices from the primitive studios of so long ago."